What's Sean doing in that hole? He's preparing the ground for the replanting of our new jostaberry bush which we'd previously put in the wrong place. A recent visitor to Dig In pointed out that we'd planted it too close to a gooseberry, and that jostaberries need a good deal of space. So Sean ventured out into the drizzle and put some muscle into digging a new hole for the bush. He fortified the soil with a good measure of fertiliser and set the bush in firmly, together with a stout stake for support as it grows bigger. So what is a jostaberry anyway? Well, it's one of the new 'superfoods' - packed with vitamins and goodness, but don't ask me what it tastes like: at least, don't ask me until later in the year when we've harvested the fruits of Sean's labour. Here are the early signs of success for Tracey's potato experiment. Last Autumn, Tracey planted some seed potatoes in the polytunnel to see if they'd be happy through the Winter and find out if they'd emerge in the Spring. Well, they certainly look well enough. We gave them a good watering today, just to help the underground tubers to swell into something big and delicious. We also earthed them up: that is, we piled more soil over the greenery. This encouraged the plant to produce more potatoes and keeps the sun from getting through to the tubers which would turn them green and unuasable. Actually, I could have told Tracey they'd grow. Every year, when I dig up my potato crop, I somehow always manage to miss a few. The following year, the forgotten tubers grow and emerge into the sunlight, usually in the most inconvenient place such as a recently-sown seedbed of the following crop. Unlike me, Tracey had the good sense to put her potatoes exactly where she wanted them to grow. 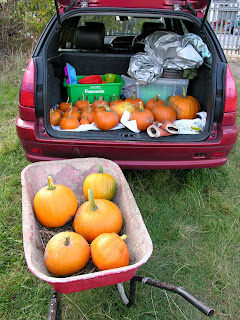 We now have lots of pumpkin seeds, thanks to the generosity of Stonebridge City Farm. They've donated us lots of seed which will be used as part of a schools project, culminating in our second annual Pumpkin Festival on 30th October. 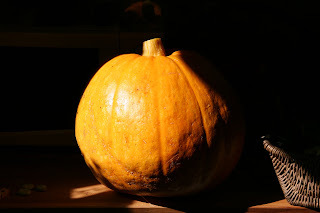 We will give out pumpkin seeds and plants to encourage schools, as well as individuals, to grow pumpkins which are then entered into various displays and competitions at the festival. Last year we had competitions for the biggest pumpkin (it was truly enormous) and for the best-decorated pumpkin. There were also lots of activities, including pumpkin food tasting, pumpkin carving, pumpkin games, and a pumpkin beauty spa. Many thanks to Stonebridge City Farm, who are based in the urban heart of Nottingham. They run their own growing projects, as well as giving city people a chance to meet farm animals and enjoy a beautiful little haven within a few minutes' walk of the city centre. As well as taking a look at their website, you may wish to check out their online petition to save part of the farm from being converted into a car park. Dig In send our thanks to Stapleford Web for providing our first listing on the world wide web. They've kindly added our details to the clubs & socities and community groups pages of their website. 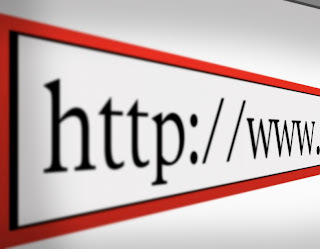 Do please take a look at Stapleford Web. It's a superb website which is packed with useful information for Staplefordians. It includes community groups, businesses, local government information and lots, lots more. You can look up maps of the area, check the weather forecast, and find easy links to local transport times, all in one place. What's more, it's a great promoter of Stapleford's "sense of place" with features on the town's history, landmarks, and notable people. Anyway we got the idea - it's a 2 yr project with the aim of gathering info and seeds of exotic (as in non-native) veggies and encouraging lots of people to grow them and generally increase the range of plants we can grow in this country. HDRA also want feedback on cultivation, cooking and eating. As a group of people ready to try most things we were keen to participate and spread the word. 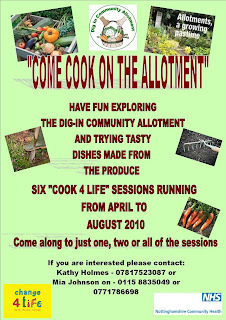 Fits in well with our AAH Veg project (Asian And Heritage Veg). Seems sensible with the advance of climate change to widen the range of foodstuffs available to us. 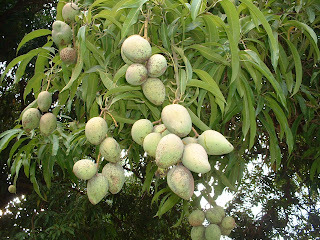 Who knows, maybe within a generation we'll be growing bananas and mangoes, yum! Then there was a fascinating look at the seed-saving area followed by lunch and shopping. Lunch was lovely yellow rice with either Thai green veg curry or lamb stew, or for greedy omnivores like me a bit of everything. We've got lots of seeds from seed swaps and donations. This is great, but occasionally we find some weird and wonderful seed which has come with no growing instructions. Here's a website we can use to get us growing. Plenty of people on site today, so we shared out all the jobs that needed doing. Good to see Perveen back with us and Mary had overcome her poorly foot too. They joined in with Yvonne and Dominic, who were along for their first morning at the plot. All these good people teamed up to tidy up and weed the sensory beds, which are filled with herbs and flowers and are designed to look, smell, taste, and feel varied and wonderful. Even the pathways are studded with colourful marbles and tactile shapes you can feel underfoot as you stroll by. Some of the plants will need to be replaced in the spring as 'annuals' don't usually make it through the winter. Nicola, Sean and Kingslee did a similar job of tidying up the bed and structure which is intended to house ladybirds: or Ladybirdland, as I like to call it. Didn't see any of the little spotted chaps, but hopefully they're sleeping through the winter in their snug little holes ready to emerge fresh and hungry to eat all the aphids that will want to eat our veg. That's our happy band in the picture, with Ladybirdland on the right. Mary had brought a huge bag of donated seeds, which ben sorted into our seed store, ready for sowing at the correct time. Meanwhile, Kathy had a site visit and discussion with an eco-loo expert as we're looking at the feasibility of building a composting toilet. i.e. The last Wednesday of the month, during the 'nice weather' part of the year. Even if it rains, there's plenty of space in the polytunnel, so you won't get wet whilst cooking and enjoying the food. All sessions run 1000-1230, and we're hoping to have a nutritionist available for at least some of the sessions, to give advice and answer your questions on food and health. We can accommodate up to 15 adults at each session, so it's essential to book by calling Kathy on 07817 523 087 or Mia on 0115 883 5049 or 07717 866 898. Children are welcome, so long as they are accompanied and supervised by an adult. If there's enough demand, we'll provide art and craft activities for the tiddlypeeps. Kathy and ben had an outing to collect manure on Saturday. Animal manure is about the best and most natural thing a gardener or allotmenteer can dig into their soil. Humankind has been doing it for millenia. Not only is it full of essential nutrients to feed the plants as they grow, but it also improves the soil structure; breaks down the heavy clay we have at Stapleford; and helps it to hold water, which reduces the amount of heavy work we'll have to put in with the watering cans in the dry summer months. Now a morning spent digging poo doesn't immediately seem like most people's idea of a good time, but this little outing had a very special destination. We collected the manure from the lovely people at Brinsley Animal Rescue centre. They do an amazing job, giving a second chance to sick, injured, and unwanted animals: anything from accident-prone hedgehogs, through rescued battery hens, to large farm animals that are 'uneconomical' for farm businesses to maintain. They are all looked after lovingly by volunteers whose vegan principles ensure that the animal's well being always come first. Do please find out more about them by clicking on the link. So the digging work was so much more enjoyable because we were in a lovely sunny paddock, surrounded by creatures that are clearly well and happy and enjoying their new lease of life at Brinsley. We had to dig carefully as we were soon surrounded by hens, clucking away contentedly as they picked over the newly-turned manure for earthworms worms and insects. 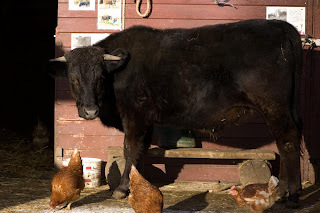 The biggest distraction was Bruce, the bull (pictured above) who was saved from being destroyed by the farmer who didn't want him because he was born blind. He spent much of his time cantering around the grass or nuzzling up to us. As an added benefit for Dig In, the manure is so much better than regular farm manure. That's because, aside from the legally-stipulated inocculations, all the animals are treated with homoeopathic remedies (as well as love) so their poo isn't full of antibiotic residue. So there's no danger of filling the soil, and hence our crops, with unwanted medications. Thanks to everyone at Brinsley Animal Rescue.